Posted: Tuesday, June 13, 2017. 9:35 am CST. 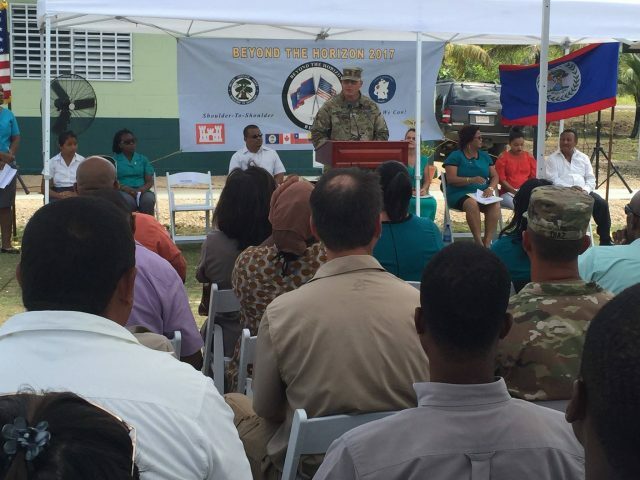 By BBN Staff: Yesterday, the U.S. Embassy and the Government of Belize in coordination with U.S. Army South, held the second ribbon cutting ceremony as part of the Beyond the Horizon: 2017-Belize (BTH) collaborative humanitarian exercise. The BTH Task Force Commander officially handed over the keys to the St. Matthew’s Government School’s new building to the principal. The ceremony took place at the St. Matthew’s Government School compound. Special Invited guest speakers included Deputy Prime Minister and Minister of Education Patrick Faber, Chargé d’Affaires of the U.S. Embassy Adrienne Galanek, BTH Task Force Commander COL John Simma, Chief Education Officer for the Ministry of Education Dr. Carol Babb, St. Matthew’s Village Chair Dennise Cedeno, Village Vice Chair Juan Martinez, and St. Matthew’s Government School Principal Michelle Murray. Students from the school also participated with remarks, a poem, a song, and a Creole dance. The new 1,700 square foot school building has three separate rooms and is built to withstand Category 5 hurricane winds. The project also includes a new bathroom facility with three bathroom stalls, sinks, and a new septic tank. The teams completed the project ahead of schedule, allowing for additional projects of opportunity, including a new playground area and a wooden deck linking the existing building’s classrooms. The new school building was built by U.S. service men and women from the reserve component and the National Guard, hailing from the Commonwealth of Puerto Rico, Montana, Texas, Wisconsin, and Colorado. The project provided the specialists the opportunity to train in their military occupations during six rotations of two-week long deployments. Reservists from the 448th Engineer Battalion out of Fort Buchanan in San Juan, Puerto Rico, provided the core management team, overseeing the duration of the project. BTH is a collaborative training exercise between U.S. Army South, the Belize Defense Force (BDF), the Ministries of Defense, Health, and Education, as well as partner nations, such as Trinidad and Tobago and Colombia. The project also includes numerous NGOs and private companies from the United States and Belize. The project is valued at USD $11.5 million, BTH furthers the U.S. Government’s continued commitment to the Government and people of Belize. BTH enhances health and education infrastructure and provides free medical services across Belize. The exercise consisted of five construction projects and three events offering free general medical and dental services across Belize. BTH started on March 25, 2017 and is scheduled to end on June 15, 2017.